The Panasonic G1 the world’s first full-time Live View Digital Interchangeable Lens Camera. 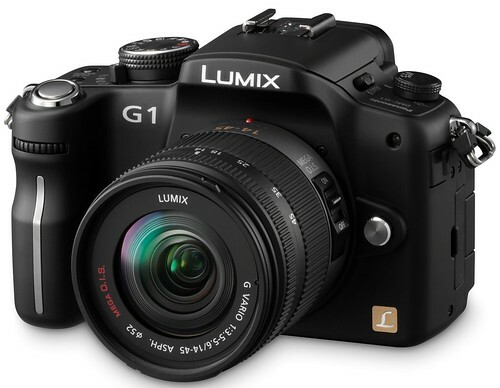 The G1 supports the micro Four Thirds platform, has a resolution of 12.1MP (Megapixels), and was announced on September 12th, 2008. The bundled Lumix G Vario 14-45 mm f/3.5-5.6 ASPH kit lens gives an equivalent 28-90mm field of view (in 35mm terms). Unfortunately, the G1 is not able to record video. Having a movie capture mode would have increased its appeal a lot more. Read the full G1 specs for more information. Download the Panasonic G1 Manual. The flash takes only about 1.5 seconds to recycle. This is a far better performance than most compact digicams. With a Class 6 SDHC card, the G1 can capture bursts at a consistent rate of 3.15 fps (frames per second). Five RAW + Large Fine JPEG gets written to the card in 3.5 seconds. You can shoot practically unlimited Large Fine JPEGs in burst mode. One negative of the Continuous mode is that you don’t get to see a live view of the moving subjects, only the shots that have been captured. Two photos are provided to compare the size of the G1 next to the Canon XS / 1000D, here’s the view from the front, and from the top. The G1 is noticeably smaller. 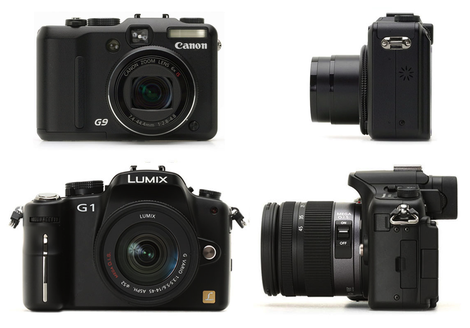 Panasonic G1 review at Gizmodo — This is a fairly well-written, hands-on review. There is a photo comparing the size of the G1 vs. the Canon XT / 350D. Adapter to mount standard Four Thirds lenses. ISO test series until ISO3200, reduced-sized. 100% crops comparing image noise of the G1 vs the Canon XT at ISO 1600 — the Canon performs a fair bit better. Panasonic G1 vs Canon G9: Size Comparison — TheOnlinePhotographer has a photo (larger size) comparing the size of both cameras. The G1 is slightly wider, but much thicker than the G9 due to the much larger size of the bundled 14-45mm lens. You won’t be able to fit the G1 in a suitcase or slide it into a pocket the way you could with the G9.